What Did the Biblical Writers Know & When Did They Know It? - Publisher For centuries the Hebrew Bible has been the fountainhead of the Judeo-Christian tradition. Today, however, the entire biblical tradition, including its historical veracity, is being challenged. Leading this assault is a group of scholars described as the "minimalist" or "revisionist" school of biblical studies, which charges that the Hebrew Bible is largely pious fiction, that its writers and editors invented "ancient Israel" as a piece of late Jewish propaganda in the Hellenistic era.In this fascinating book noted Syro-Palestinian archaeologist William G. Dever attacks the minimalist position head-on, showing how modern archaeology brilliantly illuminates both life in ancient Palestine and the sacred scriptures as we have them today. Assembling a wealth of archaeological evidence, Dever builds the clearest, most complete yet of the "real Israel that existed during the Iron Age of ancient Palestine (1200-600 B.C. ).Dever's exceptional reconstruction of this key period points up the minimalists' abuse of archaeology and reveals the weakness of their revisionist histories. Dever shows that ancient Israel, far from being an "invention, " is a reality to be "discovered. Equally important, his recovery of a reliable core history of ancient Israel provides a firm foundation from which to appreciate the aesthetic value and lofty moral aspirations of the Hebrew Bible. 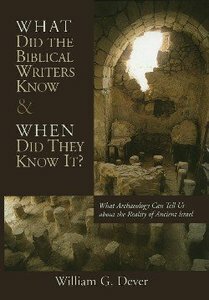 About "What Did the Biblical Writers Know & When Did They Know It?" For centuries the Hebrew Bible has been the fountainhead of the Judeo-Christian tradition. Today, however, the entire biblical tradition, including its historical veracity, is being challenged. Leading this assault is a group of scholars described as the "minimalist" or "revisionist" school of biblical studies, which charges that the Hebrew Bible is largely pious fiction, that its writers and editors invented "ancient Israel" as a piece of late Jewish propaganda in the Hellenistic era.In this fascinating book noted Syro-Palestinian archaeologist William G. Dever attacks the minimalist position head-on, showing how modern archaeology brilliantly illuminates both life in ancient Palestine and the sacred scriptures as we have them today. Assembling a wealth of archaeological evidence, Dever builds the clearest, most complete yet of the "real Israel that existed during the Iron Age of ancient Palestine (1200-600 B.C. ).Dever's exceptional reconstruction of this key period points up the minimalists' abuse of archaeology and reveals the weakness of their revisionist histories. Dever shows that ancient Israel, far from being an "invention, " is a reality to be "discovered. Equally important, his recovery of a reliable core history of ancient Israel provides a firm foundation from which to appreciate the aesthetic value and lofty moral aspirations of the Hebrew Bible. William G. Dever (Ph.D., Harvard University) is professor emeritus of Near Eastern archaeology and anthropology at the University of Arizona in Tucson. He has served as director of the Nelson Glueck School of Biblical Archaeology in Jerusalem, as director of the W. F. Albright Institute of Archaeological Research in Jerusalem, and as a visiting professor at universities around the world. He has spent thirty years conducting archaeological excavations in the Near East, resulting in a large body of award-winning fieldwork. Prof.Dever is the author of What Did the Biblical Writers Know and When Did They Know It? : What Archaeology Can Tell Us about the Reality of Ancient Israel,Did God Have a Wife? Archaeology and Folk Religion in Ancient Israel and Who Were the Early Israelites and Where Did They Come From?